I recently finished watching the drama Yasuko to Kenji. Of course, most of the drama I watch are comedy romances based on manga and this is little different. This one’s based on a manga by Aruko (ok, I hadn’t heard of it before the drama aired…) and really enjoyable. 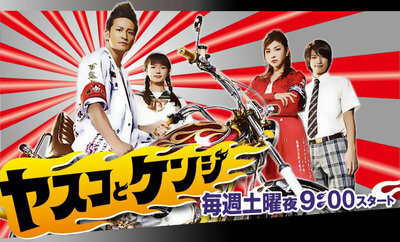 The story is about an ex-biker gang leader Kenji, who gives up his old ways to look after his younger sister Yasuko when their parents die in car crash. Kenji becomes a best-selling shojo manga artist (!) to support them, but finds it hard to control a younger sister now well into her rebellious teens and itching for romance. The series follows their relationship, tested by the appearance of a romantic interest for Yasuko and an old rival of Kenji’s. (Spoiler alert: Some spoilers in the discussion, so don’t read if you don’t want to know).